Product Description: Inspired by famed occultist Aleister Crowley’s 1923 novel of the same name, Agusti Villaronga’s film centers around the extraordinary 12-year-old David (Enrique Saldana), who has been adopted by a treacherous scientific cult where extraordinary mental powers are common. He begins an archetypal journey across two continents with Georgina (Lisa Gerrard) to find his destiny as Child of the Moon. This is directed by one of my all-time favorite directors, Agusti Villaronga. He directed one of the greatest films to ever grace the cinema world. The one and only masterpiece and most assuredly, disturbing, visceral In a Glass Cage. Moon Child is his second feature film. Equally disturbing and vividly shocking. 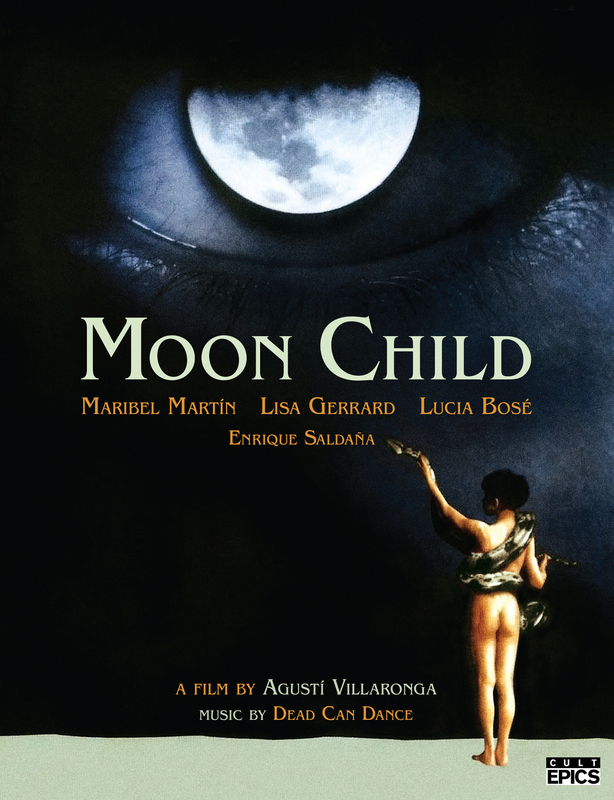 I had never seen Moon Child so this was my treat to experience this powerful, disturbing gem of a feature for the first time. What better way than to experience it on a High Quality and equally impressive and amazing Blu-ray/DVD combo by the wonderful stand out company Cult Epics. This is a must own, must experience Blu-ray. A High Definition perfection. A glorious film of visual ecstasy. A powerhouse piece of cinema both passionate and sublime. Equally parts dramatic and equally parts a mind screw. This is a wonderful mind trippy reality that only a true visionary talent could create. Cult Epics has honored and embraced this visionary film in a whole new outlet. They have crafted an excellence that all film companies should look to express their products. This Blu-ray is a top notch experience that I highly praise and highly recommend. Starring a wonderful cast of actors and actresses. Enrique Saldana is by far one of the greatest experiences of this film. He plays the Moon Child the Character of David. His talent bleeds on screen. His performance throughout is a stunning beauty that mere words can’t express. It’s so hard to believe that this is his only feature film. He masters so much in this film. The character of Georgina played by Lisa Gerrard is another equally mastery crafted experience on screen. The chemistry between all the performers is solid brilliance that few movies can grasp. Moon Child is an ultimate trip. A trip of dramatic wonder and artistic expression through powerful dream like moments and visual intensity. Also, in this film is the amazing and stunning beauty of David Sust. He played one of the all time greatest characters in cinema history in the film already mentioned In a Class Cage. His performance as Angelo in, In a Class Cage still haunts me to this day. Seeing him in Moon Child was a total treat of cinema perfection. Why he stopped acting in 1990 I will never know, because his brilliance is beyond words. Also adding to the amazing one of a kind film is the unreleased soundtrack by the band Dead Can Dance, adding a truly gifted reality to an already gifted film. Cult Epics went above and beyond with this release. I highly praise this amazing product. Truly a one of a kind film, a one of a kind product. As I have already stated a flawless transfer. The audio and video are priceless and there is no fault in my book. I don’t nick or pick, I just experience the love and craftsmanship that is put into these Cult Epics Blu-ray products. To me the love is always present when you experience one of these new High Definition outlets. A very nice collection of Special Features. Cult Epics is one of those companies that know the fans and know what the fans want. They supply features that make the buy of the Blu-ray worthwhile. Limited Edition Slipcase & Tarot Card for the First 500 Prints. One of the best Blu-ray's done. A must own experience that leaves a fresh, new, crisp reality of this old-school visual fantasy for a new generation to experience in all its visual nature. Cult Epics did a wonderful and utterly amazing job. I was in heaven with this Blu-ray. The audio and video are something extraordinary to experience. It's like seeing a new film all over again. Vibrant in colors and audio is nothing less than ear candy. I highly recommend this product. I highly praise this product because this is a film that deserves an important outlet. It's a film that should be honored and respected and Cult Epics has done that with this release.